Making goop is a great scientific experiment. Kids are fascinated to see two ingredients that when mixed together behave completely different than either one of them did by itself. This goop recipe requires only two ingredients. It’s perfect for younger children, since both ingredients are non-toxic. No need to worry if some of it accidentally gets ingested. You’ll only need water and cornstarch. Mix the water and cornstarch in a small shallow dish. The new product behaves both like the liquid water and like the solid cornstarch. Ask kids to press their finger in the mixture, or pour it into a second dish. This goop recipe is a little more involved than the first one and since it uses borax, you should caution the kids to be careful when handling it. Pour the glue in one of the paper cups. Add a tablespoon of water and stir until the two are mixed well. Mix the borax with four tablespoons of water in the second paper cup. Add one tablespoon of this mixture to the glue and water mixture in the first paper cup. If the glue mixture doesn’t turn into a gel, add another tablespoon of the borax mixture to it. Take the gel out of the paper cup and roll it with your hands until it firms up a little. The goop is ready to play with. For different colors of goop, add a few drops of food coloring to the glue and water mixture before adding the borax. Make sure the kids wash their hands when they are done playing with the goop. Encourage older kids to describe which of the properties of goop seem more like a liquid and which seem more like those of a solid. Start by having them look at the goop and make predictions about how it will behave once they try to pour it, and touch it. 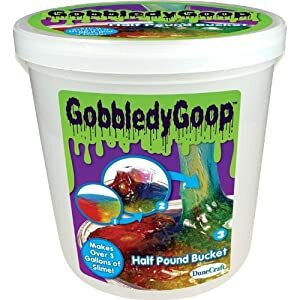 Let them get some “hands-on” experience with the goop (literally) and observe how the goop actually behaves, which should be quite different from what they expected after just looking at the mixture. The borax goop experiment is also a good exercise in following directions. The goop won’t turn out right, if they do not follow the recipe exactly. Give this a try. It may get a little messy, but that’s what makes it fun and interesting for your kids.